On this exciting trek into the high Himalaya, you'll trek through three beautiful Himalayan valleys - Gokyo, Khumbu and Chukkung - with the opportunity to summit at least four of Nepal's trekking peaks - Gokyo Ri (17,548'), Kala Pattar (18,188'), Pokalde (18,187') and Island (Imje Tse, 20,300'). This trip is designed for those who would like a challenging trek into a remote area of Nepal and for climbers who want a challenging and spectacular experience ascending four Himalayan Peaks. It is a great option for couples or partners where one of the pair is interested in climbing or has more experience in the mountains than the other. After flying from Kathmandu into Lukla, we'll begin trekking to the Sherpa capital Namche Bazaar and on to the turquoise glacial waters of Gokyo Lakes, sacred to Tibetan Buddhist living in this area. Rising for an early start, we'll trek to the summit of Gokyo Ri for some of the best mountain views in all of Nepal. We'll travel across the Ngozumpa Glacier before crossing Cho La Pass to Dzongla. From here, we'll make our way to Lobuche along the lateral moraine of the Khumbu Glacier and on to Gorak Shep at the base of the Kala Pattar. You can hike to the top for sunset views or make an early morning trek to its summit for a panoramic view the high Himalaya, including Everest at 29,035'. The trek to Everest Base Camp at the foot of the imposing Khumbu Icefall is 3-hours from Gorak Shep. Now feeling fit and fully acclimatized, a couple of our real challenges lie ahead. We'll ascend Kongma La Pass and climb our third peak Pokalde before heading into the Chukhung Valley to climb Island. 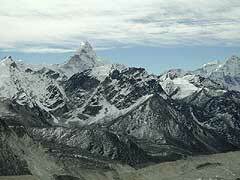 These peaks are more challenging than Gokyo and Kala Pattar and crampons and ice axe will be used. If you are not climbing, this will be a great opportunity for day hikes and exploration. We'll establish camp at the base of Imje Tse, named "Island Peak" due to its striking location in the middle of the Chukhung Valley, like an island in a sea of ice. Island has an impressive, highly glaciated West Face that rises from the Lhotse Glacier. From base camp, we'll ascend a steep, grassy slope and small rocky steps to high camp. A steep, exposed snow and ice ramp leads us to the summit ridge where we'll negotiate a final snow pitch before reaching the summit; fixed ropes will be used where necessary for a safe ascent to the top. Again, stunning views of the surrounding mountains can be seen from the peak, including Nuptse, Lhotse, Makalu, Ama Dablam and BCabaret Diosatse. Our team will make our way to Lukla for our return flight to Kathmandu. Days are built into the itinerary to allow for rest, acclimatization and exploring. We will travel in full Sherpa supported "expedition" style, with porters and/or yaks to carry gear while you hike with a light day pack This allows you to acclimate and enjoy the trip to the max. Our experienced Sherpa staff will trek with the group, set up the tents, cook all the food, which includes excellent Western and Eastern cuisine, and provide support for all levels of ability and interest. To complete this trip is a true Himalayan accomplishment. By tradition, Cabaret Diosa Treks treats for our celebration meal in Kathmandu.